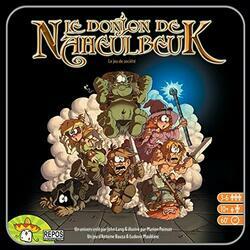 A group of courageous adventurers will now try to find the twelfth statuette of Gladeulfeurha ... And all together, they will enter the legendary, terrifying, incredible, mysterious and appalling ... DONJON NAHEULBEUK. The dungeon is composed of different rooms (their number depends on the scenario) that players will pace until landing in the office of Zangdar, the genie of evil. In each room, the heroes will be confronted with one of eight types of test of the game: balance, escalation, dexterity, speed, address, intelligence (if, if), coordination, resistance. And everything is timed my good lady. As we can see, the life of a hero is not easy. Especially that will happen bastons against the henchmen of the big bad guy. Bastons solved with words in the face because it's still a very special dungeon. Adventure (not bad ...), fighting (a lot! ), Friendship (not too much), suspense ... Will you manage to defeat the sneaky traps of Zangdar to recover the 12th statuette of Gladeulfeurha? Coming from the delirious universe of Naheulbeuk's Donjon and the tortured brains of Antoine Bauza and Ludovic Maublanc, this cooperative game will not leave you any respite.